The week after Christmas is when you’re supposed take your tree down. This year we had two and I suspected that the one in your bedroom would be the toughest one to actually put away. We told you a few days in advance so that you could savor those last few nights with your hard-earned Christmas tree. You looked at us and simply asked why? Why do we have to take the tree down? And Daddy and I stopped and looked at one another. Why is that? Where is that rule written? So, we packed away our big tree and allowed the whimsy of Christmas to stay in your bedroom. This morning, I walked into your room and saw that you had removed most of your ornaments from your tree and “decorated” your entire room. 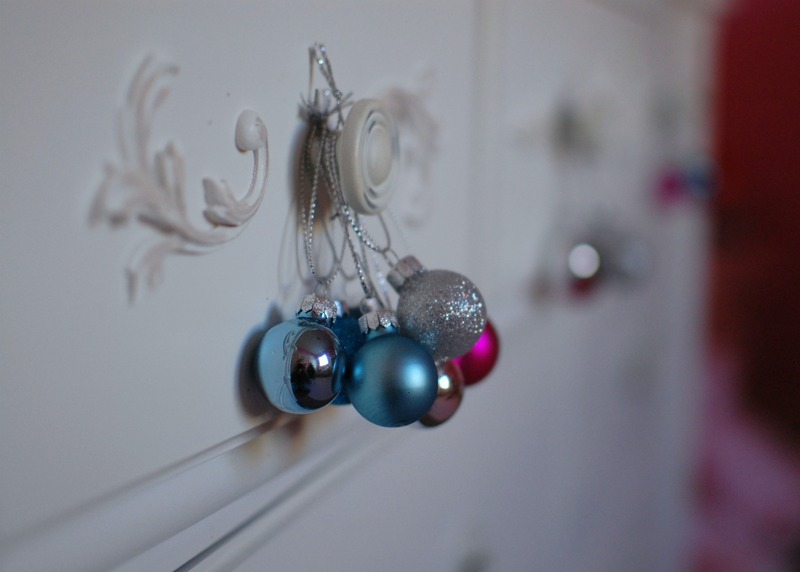 Small shimmery ornaments hung from every knob, pull, and hook. My first thought was to tell you that although we were letting you keep your tree up, you would have to leave the ornaments on the tree. But then, I asked myself why? Why shouldn’t you be allowed to be a four year old? Why couldn’t the ornaments hang from dresser knobs? You decorate that dresser, Katie. And I’ll sit back and marvel at your creativity and joy. I just love children at that age, they're so THEMSELVES. When did we lose that? Well done, Katie. And well done, you. not that it is quite the same (but maybe it is), I have been reading "How the Grinch Stole Christmas" every night since last Christmas. Not 2011 but 2010. We started reading it before Christmas 2010, I packed away all the rest of the Christmas books, but this book Elizabeth kept requesting each night. And requested. I had it completely memorized about July. And we've been going strong each night since. We've missed a few here and there, but not a whole lot. It's kind of funny to read about it when it is 80 degrees and the sun is still shining at bed time, but there you go, you just go with it!! and I do leave some lights up and decorate with snowmen and snowflakes until I decorate for Valentine's Day. So what it a few ornaments around her room love it!! I love this. I will always remember you writing about not wanting her to feel like she has to be "perfect," and this little bit of whimsy is lovely. Yay Katie!! Love it! I am always trying to put my kids and family in a box that I think they "should be" in…when in reality, shouldn't we all be just a bit outside it all? And can you even imagine how cute she was placing each one and making her room beautiful? Keep making things beautiful, Katie. Just like your mommy. A great post for me to ponder. I have always been a rule breaker myself, but I still seem to expect the girls to follow the beat of another's drum. Thank you for this. Yes! Why not? Is something we should always be asking ourselves. Nice job on the January banner, looks awesome! You are such a good Mom. Keep letting her let her spirit shine. I love this. I love watching them be themselves. When did we lose this? I wish we could still do that. Teach me oh wise and patient one! Your ability to be calm and bask in the lights of life amaze me. I am truly envious of that. That is exactly what I want for myself this year. Seriously. Teach me! Our girls would have fun! I string lights around my kids' windows for Xmas and they stay up until they burn out. I love that your daughter has these creative impulses and I LOVE that you can let her just be! She is adorable. It is great that she asks why. We lose that as we grow older but really we should always ask why in life. When my stepfather was dying of cancer and we knew he would probably never see another Christmas, we kept the tree up and I made decorations for Valentines Day and St. Patrick's Day. He never made it to Easter, but he had a holiday tree up nearly until he died. Nice memory. Bittersweet. Same message. Live the moments you have to the fullest. Keep up the tree. What an amazing spirit she has. And how beautiful that she's relinquished some of that back to you. When do we lose that innocence and why do we, as parents, always try to brush that mindset and simplicity aside. Kids are awesome. She's quite the decorator. Good for you guys for letting her appreciate her interior design. That's fabulous. And a sign she's going to be a great decorator when she grows up, because that dresser looks good! Oh that's just precious. I love your girl! Very cute. 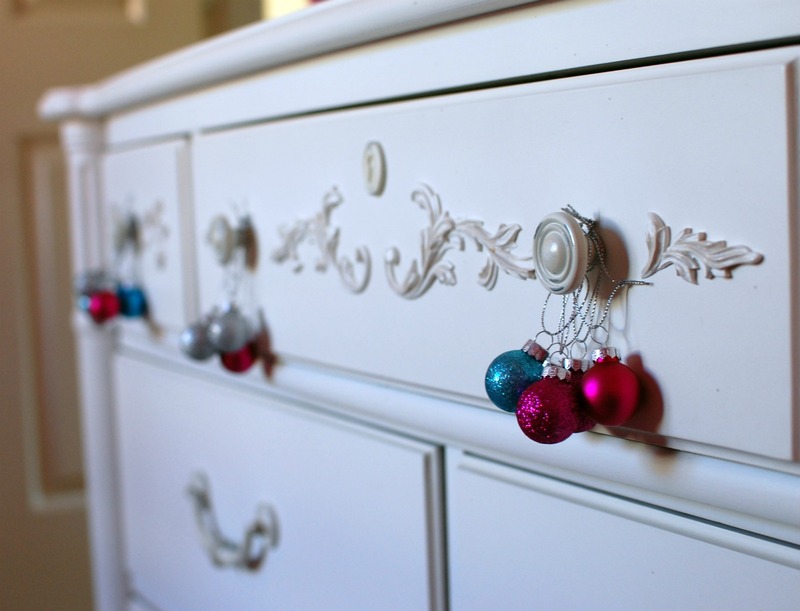 The ornaments add a little punch to the dresser. I like it! I love your posts. So simple and yet so many things said between the lines. Katie was exactly right, and kudos to you for letting her be 4. Sometimes the hardest thing about being a mama is letting our kids be kids. You know what? That kid is on to something. That actually looks reallly lovely. Sometimes we just need to let our kids wings fly on their own. Let them do what makes their hearts happy. Brilliant, let her keep the cheer and smiles. I love her draws too! I still have whimsy all over my house. Oh my word how sweet. Yay, Katie and yay, you for writing such a profound post. This really made me stop and think about the whimsy and wonder of our children. I love this and McKenna would do the exact same thing. I love seeing them be themselves, especially as girls, when we know that sooner or later they may change a bit to be like others. I hope I can raise my girls to always be true to themselves and love who they are and hang Christmas bulbs from their dresser. I've been trying to be more intentional about what I choose to let my boys do. Sometimes, my gut reaction is to say no, or you're not supposed to… and then I realize, WHY NOT? I big puffy <3 this. Perfection! Love this! Thanks for the reminder!! !